Risty "Benevolent Bandit of the Wilderness, Indomitable Heroine, Listy"
A wild bandit who walks into Leina having a battle with Melona. Leina is almost killed by Melona but Risty saves her life. 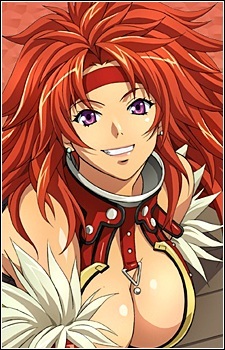 Leina then spends all her time in the anime trying to follow Risty before she goes to the Queen's Blade competition.